During the first September week, the Faculty of Arts, Charles University, Prague (Faculty of Arts, Main Building, Room no. 325) will host the interdisciplinary workshop Generous Patrons Loyal Clients. The workshop is organised by Phd candidates of the Czech Institute of Egyptology, Martina Bardoňová and Věra Nováková. The workshop is dedicated to the topic of patronage across the societies. Patronage is a term denoting an informal, unequal but reciprocal relationship between two persons. The partner of higher standing (patron) provides the person of lower standing (client) with protection or other goods. The client pays him back with loyalty or other services/goods. The importance of the patronage resides in the fact that in some societies it may become one of the dominant relationships and permeate the state administration and government. The main aim of our workshop is to provide scholars from various disciplines with the opportunity to engage with each other to discuss the typologies of sources coming from a wide range of societies and the types of traces which patronage leaves in them. Our main foci for this workshop will be discourse on these questions: What type of sources patron-client relations may be discerned in respective societies? What kind of evidence can be found within these sources? The workshop will be divided into four sessions dedicated to different topics: 1. general questions related to the existence of patronage in a variety of societies; 2. patronage of artists and craftsmen; 3. royal patronage; 4. patronage in the international relations. Each of the sessions will be introduced by a lecturer of a renowned keynote speaker. These will we be Prof. Miroslav Bárta and Doc. 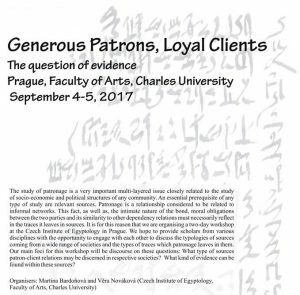 Jana Mynářová, both from the Czech Institute of Egyptology, the latter presenting a joint paper with respected Polish scholar Lena Fijalkowska. The remaining keynote speakers are Dr. Mark Lehner, the director of the Giza Plateau Mapping Project, and, Dr. Gersande Eschenbrenner-Diemer, a Marie Curie scholar at University College London. Gersande Eschenbrenner-Diemer (Institute of Archaeology, UCL London): Wood craft and patronage: which material evidences? 11:00–11:25 Massimiliano Nuzzolo (Czech Institute of Egyptology): The Appearance of Osiris: a case of royal patronage or a bottom up process?